If you're hoping to be driven crazy with curiosity this weekend, this British mentalist has got the show for you. 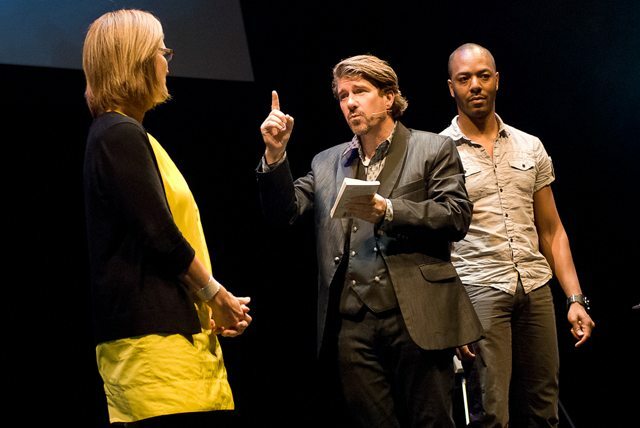 Banachek (centre) performs one of his baffling mindtricks on a couple of unsuspecting audience volunteers. June 8–9, 8 p.m.; June 10, 2 p.m. The thing is (spoiler alert) Banachek makes no bones about the fact that though he’s been practicing this art for most of his life, none of it is real. If his story itself is to be believed, when he was a teenager the entertainer spent four years being studied by scientists at Washington University. Throughout this ongoing study, which was funded by a half-million-dollar grant, Banachek managed to convince the men he had genuine psychic abilities. “But everything we had done was a trick. We had fooled the scientists,” he explains during his show. This knowledge didn’t hinder our enjoyment of the performance; not in the least. In the first half of the show, Banachek invites two volunteers onto the stage; each of them is asked to look at the back cover of a paperback book held up by Banachek, and to choose a random word from that book. And lo and behold, he is able to guess first the individual letters, then the entire words they were thinking of (“China” and “colour,” in case you’re comparing notes from a subsequent performance). Now, a skeptic would assume that perhaps these volunteers were fakes, planted in the audience before the show. But one of Banachek’s assets is that throughout the two-hour performance, he gives a high number of audience members the chance to see him perform up close—and as luck would have it, one of those volunteers was us. After we approached the stage and dutifully tugged at and knocked on the metal blindfold he prepared to put on—over the layers of duct tape also covering his eyes—we entered the audience to select three objects at random from complete strangers. And then, with us holding each object over his head, he guessed exactly what each one was with alarming specificity (for example, not only that we were holding plastic sunglasses, but blue and yellow plastic sunglasses). Considering that we were standing close enough to check his ears for tiny microphones, this was impressive trickery indeed. You can strain your neck and edge as far off your seat as you want, but there’s no question that Banachek is a master of his craft—there’s a reason he counts Penn & Teller, David Blaine, and Criss Angel among the acts he’s consulted for. Even after he tells you it’s not real, every trick is followed by a single question, rippling through the crowd: “How did he do that?” It may not be magic, but that’s okay—it’s still mystery, suspense, and high entertainment.